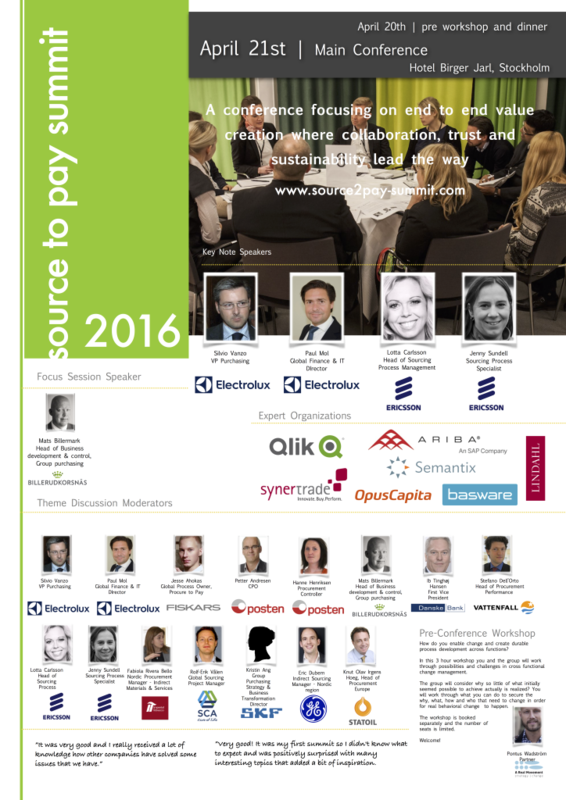 It is that time of the year – we are getting closer to the annual Source 2 Pay Summit during which EBG | Network gather managers from across businesses, across countries and across industries. Our philosophy is simple yet effective – allow experiences managers to share ideas and exchange knowledge with peers and expert organizations in an informal yet highly structured setting. Allow moderators to discuss topics of relevance to them thus ensuring the relevancy to others. This will be the sixth annual Source 2 Pay Summit and we are welcoming a great number of managers sharing their insights and inviting you to share yours. Win-win. Expert organizations sponsor the summit ensuring EBG can keep a really high content standard as well as introducing their competence to you who join. 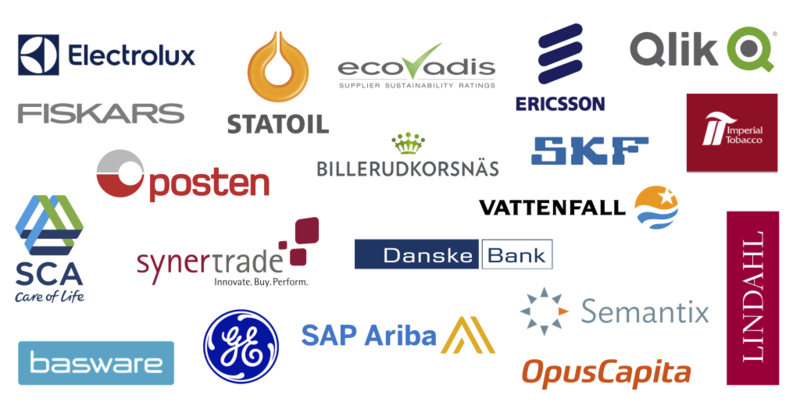 Expert organizations in 2016 are Lindahl, Qlik, SAP Ariba, SynerTrade, EcoVadis, Basware, Semantix and OpusCapita – a broad area of expertise gathered under one roof. Theme Discussions have a big part of the Source 2 Pay Summit program. Under 4 x 40 minutes you can sit down with peers! Choosing what discussions to join come at a first come first served basis with a maximum number of seats at each table. Ib Tinghøj Hansen, First Vice President, Danske Bank | Benchmark: How is your current system setup behind the source-to-pay process covered today? Jesse Ahokas, Global Process Owner, Procure to Pay, Fiskars | Benchmark: How can we prevent fraud in the P2P area? Mats Billermark, Head of Business development & control, Group purchasing, BillerudKorsnäs | Business tourism or value creation regarding supplier evaluations? Rolf-Erik Vålen, Global Sourcing Project Manager, SCA – Hygiene and Forest Products Company | Benchmark: What are critical success factors for a purchase to order (P2O) system? Fabiola Rivera Bello, Nordic Procurement Manager – Indirect Materials & Services, Imperial Tobacco | Benchmark: How are you managing tail spend and what are the lessons learned in the group? Petter Andresen, CPO & Hanne Henriksen, Procurement Controller, Posten | Benchmark: How to best control indirect spend using a procurement system? The idea behind looking at end-to-end processes across functions and industries come from the understanding that as businesses grow more global and the ways we do business and execute business changes, the harder it becomes yet more opportunities are brought before us, to not only gain control but also ad value where value has possibly not been added before. 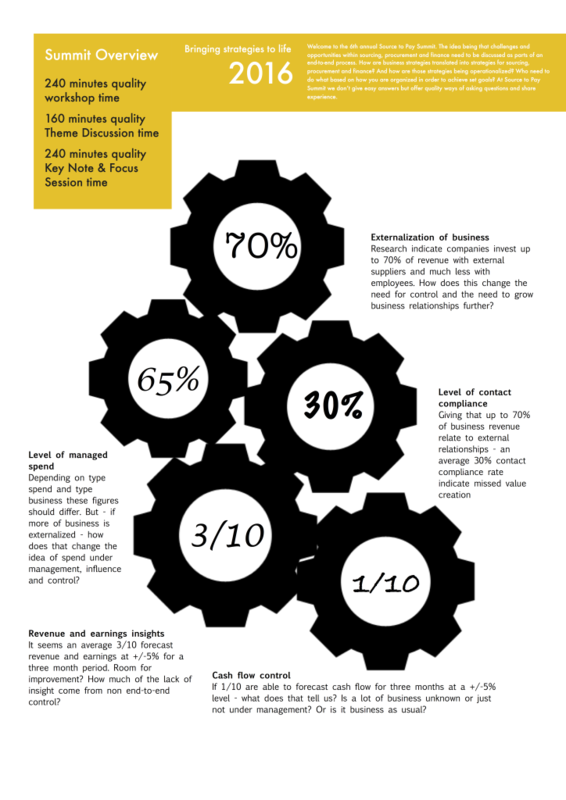 This image and overview somewhat describe the need for a holistic approach to businesses and the ways we do business. Do you agree that more of businesses are externalized, that organizations invest more of revenue with external suppliers, consultants and contingent workforce? That a quite large extent of the contracts and agreements you have are not complied? And secondly are perhaps not adding value either due to its structure? That both revenue, earnings and cash flow are hard to predict on an accurate level? If you agree to any of the above EBG hope to see you in April!